CACN members Jeff Rider of Cloudwrangler Comics and Johnny of the Barntstormers will be at San Francisco Comic Con this weekend. 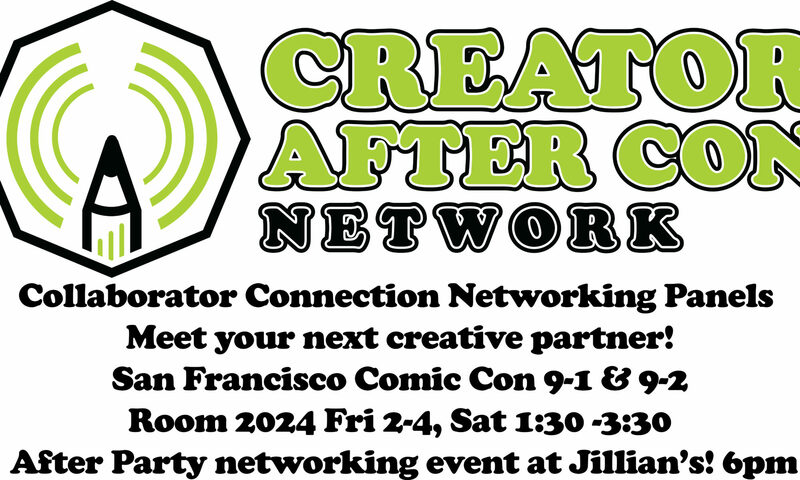 They are hosting our first 2 Collaborator Connection Panels, where you can meet your next creative partner. These panels are like speed dting for creators, you’ll get 2 hours to meet folks and find that next awesome partner to make comics. If you attend the panels, you’ll here these guys talk about the importance of “reaching out” afterwords. It’s imperative when networking to land a solid follow up email as soon as possible, maybe even before your head hits the pillow that night. But these emails don’t always come naturally to some of us. Thankfully, we have an easy to cut and paste template you can use RIGHT HERE! We got to meet at the Collaborator Connections panel during (whatever Con we were just at) and I really enjoyed talking to you and looking at your work, specifically (YOUR AWESOME THING). Hopefully we can find something to collaborate on! Please add me on your social media channel of choice, and let’s keep in touch directly! It’s that easy! Check out the homepage for all the details on these panels and the LEGENDARY CACN afterparties! See you in San Francsico! Next PostNext UPDATED – Announcing the Creator After Con Network Anthology!